Taste of Home recently kicked off their nationwide search for Mrs. Holiday -- The winner to receive role with company and $50,000. To audition for the role of Mrs. Holiday, women age 18 or older must visit Facebook.com/Taste of Home to enter the virtual pageant. 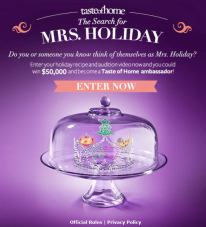 Consumers will have a hand in picking Mrs. Holiday by voting for their favorite entrant at Facebook.com/TasteofHome starting on June 4 and ending on September 7. Mrs. Holiday will be selected from among the top 100 vote getters by a panel of experts. Once crowned, Mrs. Holiday will be available to conduct interviews, cooking segments, and blogging, as well as to make appearances across the country at retailers and some of the more than 300 Taste of Home cooking schools.